Transitioning home is not always easy after a hospitalization. There is so much to remember; what the doctor wants you to do, medications to pick up from a pharmacy, getting your home prepared with food, preparing meals, linens for bed and bath, etc. Our New “Transitions to Home” program helps seniors by reducing the stress of discharge and ensure a safe return to home. Statistics show that seniors who are discharged from the hospital can be quickly readmitted due to two main reasons: lack of follow through with after cares doctor appointments and medication mis-management. We understand the first few hours home after a hospitalization is critical to your recovery. 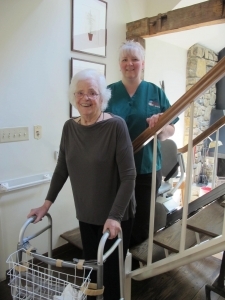 Family Caregivers Network provides safe, reliable transportation home, a re-acclimation to your home environment, and high quality care for your loved one. To reduce avoidable readmission to hospital or rehab. Provide families with a fully coordinated transition to home. Reduce stress and provide peace of mind with transition to home. Billed in 4 hr, 6 hr, or 8 hr. shifts. The “Transitions to Home” program can alleviate the stress associated with a recent illness and hospitalization. Ongoing assistance at home is also available to with short term or long term care. All caregiving staff have gone through a Family Caregivers Network certified training program and are bonded and insured. For more information on the Transitions to Home program and other services offered by Family Caregivers Network call 215-541-9030.